We shall call you back as soon as we have a line available. Passed Matric? Where to Now? Here are the Matric results 2017 release date: 4 January 2018. The next day, 5 January 2018, you can get your results online or from your school, or in the newspapers. Online you can get your results from the website of the Department of Education. To get your results online, you need your Exam Number, Home Language, Name, Surname and Contact Details. The IEB Matric Exam Results will be available on the IEB website. For the Matric results 2018, go to the live news event on News24. The Department of Basic Education releases the 2017 Matric Results Technical Report, see the Live Video Here. What Courses can I Study Without a Matric Certificate? You can get your results by using your Cell Phone Quick codes, what you need to do is, dial *120*35658# on the day that the results are released. You will have to answer different questions and enter your ID number, and you will then get your results per subject. You need to opt-in to get your results, so remember to select that option. USSD rates will apply. One of the first ways to getting your results is to log onto the Department of Basic Education’s website below. If you went to a public/government school, then your results will definitely be on this site. On 5 January 2018, your school will give you your results. You can also read more about education in MyNews24. If you are interested in the national and provincial pass rates of matric for 2017 then look no further as we have all the data right here. The Matric pass rate for this year and how it compares over the last 9 years. The National Pass Rate Per Province. This shows that matric pass rates are increasing really well, which is without a doubt a good sign. The IEB matric pass rate this year was great, increasing from the already high 98.67% in 2016 to new heights of 98.76% in 2017. These results are from the 112 000 students who wrote the IEB exams nationwide. 88.50% of those IEB students are able to study for a Bachelors degree with their marks. There are two main ways that you can get your matric results right on your phone! You can get your results by SMS and by Unstructured Supplementary Service Data (USSD). Through Prompts enter your ID number and your student number. This costs R0,50 per 20 seconds. On Friday (29 December 2017) the Umalusi council approved the results for the Matric Class of 2017. For the first time in many years, there were no leaked papers. Umalusi says that the quality of student answers has improved, and that marks has improved overall. Watch the Umalusi announcement on YouTube. Finished with Your Matric? What Will you do Next Year? Congratulations on finishing your school career! If you got great marks and you are on your way to university, then you are one of the lucky few, so go for it and make a success of your higher education studies. If you are not going to university because you could not get a space, or your marks are not good enough to get university entrance, there are still many options available to you. What Does my Pass Mean? With a Bachelor’s Pass, you can apply to study for a degree at a university or university of technology. You can also study for a higher certificate or diploma. With a Diploma Pass you can register for a bridging course at a Further Education and Training (FET) college or Technical and Vocational Education and Training (TVET) College or a diploma course at a university of technology. With a Certificate Pass you can study for a Higher Certificate. What Study Options do I Have if I Failed Matric? 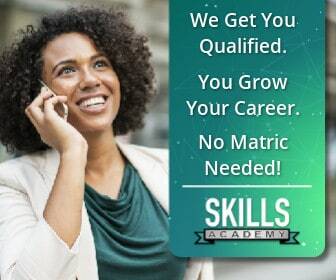 There are many courses you can study if you failed matric. You don’t have to go back to school, you can start right away with training that will help you build a real career in the world of business. Here are 16 college courses that you can study right now. Looking for a college where you can study? Here is a list of colleges you can look at. Here is a list of accredited distance learning colleges. Here you will find lots of help and courses for students who never finished school. Even if you just have your Grade 10, there are accredited courses you can study. Now that you have figured out where you went wrong you can take steps to improve your situation, this is not difficult but it does take a lot of time. Not everybody gets to write Matric, and of those that do write Matric over 50% fail. If you absolutely have to get a Matric, the only way to do that is to go back to school. You can approach your nearest high school and talk to the principal to find out what options they can offer you. You can also register for an Adult Basic Education and Training (ABET) course. ABET courses give you a qualification on the same level as matric. You could apply to have your papers re-marked. Remarking is expensive so you should only do it if you honestly feel you did better than the mark you got, this means that you will not rewrite your exam but you will ask that it gets marked again. Also be sure to check your local newspapers for the re-marking deadline date and fees. Students from no-fee schools may not have to pay application fees. If you have failed less than three subjects, you may apply to write supplementary exams. The deadline date to apply is usually near the end of January. Supplementary exams are free! If you need more information you can get hold of the Department of Education via their website www.education.gov.za, email info@dbe.gov.za or phone them on 0800 202 933. If you feel that redoing your Matric will help you in the long run, then you will need to repeat the year. Talk to the principal of your school to find out how to do this. This way you can rewrite your exams next year and if you have figured out why you failed in the first place, you can pass your exams the second time around. What happens if you fail an assignment? I lost my matric certificate, how do I get a new matric certificate? I have my Matric… what now? Your 10 Tips to get a job! I dont have matric how do I get it? Courses where matric is not required? I didn’t pass matric, what are my options? Where can I further my studies if I don’t have matric?